Puget Sound Workers’ Compensation Trust (PSWCT) is here to help you celebrate your health. The national non-profit, Healthy Schools Network, has designated April 2 as National Healthy Schools Day. Learn about their organization here. This organization focuses on student health and is run mostly by parents. While not widely known, this Day is a good time to remind folks about the importance of a healthy school environment. Need some ideas on how to create a healthy classroom? Check these links from the Department of Health and Puget Sound Workers’ Compensation Trust. Want more information about indoor air quality or chemicals in the classroom? Contact Elizabeth Jakab at PSWCT. She is our resident expert and available to answer all your questions. 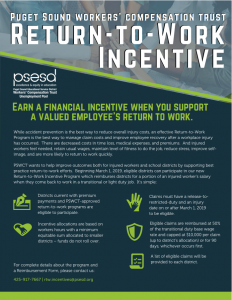 Puget Sound Workers’ Compensation Trust (PSWCT) is pleased to introduce a new Return-to-Work Incentive effective March 1. This incentive is designed to be a sustainable, equitable framework to support members in implementing best practice Return-to-Work Programs. Second only to accident prevention, an effective Return-to-Work Program is the best way to manage claim costs and improve employee recovery. The criteria for this program were modeled on the Washington State Labor and Industries (LNI) incentive, with some changes made to fit the structure of a self-insured program. Most importantly, districts will need to have a PSWCT-approved Return-to-Work Program. Districts receiving the incentive are budgeted an allocation that expires at the end of the year and does not roll over into the next year. PSWCT is using an equitable method to calculate the amount of incentive pool funding allocated to districts. Allocations are based on worker hours, with a minimum sum allocated to smaller districts. 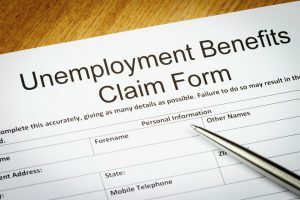 There are claim-specific eligibility criteria, such as the claimant having a medical release to restricted duty, as well as an injury date that falls on or after the Return-to-Work Incentive Program start date, March 1, among other factors. Unused incentive funds for the period cannot be rolled over for future use. Compensable with injury dates on or after start of Return-to-Work Incentive, March 1. Medical release for the injured worker to return to work with restrictions. Restricted duty placement accommodated until unrestricted return to work or 90 days have elapsed. Reimbursed at 50% of the transitional duty base wage rate and capped at $10,000. Eligible claim payments not to exceed the pool of funds allocated to the member district annually. Claims with injury dates prior to district’s PSWCT membership NOT eligible. School districts receive list of eligible claims from PSWCT. School districts use PSWCT’s Return-to-Work Incentive reimbursement form to submit reimbursement requests for eligible claims. School districts complete reimbursement form in its entirety. School districts submit reimbursement requests for all eligible claims no later than December 31 following the end of the fiscal year for which the reimbursement request is being made. PSWCT reserves right to suspend incentive program at any time. Curious about fine-tuning your district’s Return-to-Work Program or to learn if your plan is considered “approved” by PSWCT? Contact our Return-to-Work Manager, Aliza Hauser. Need more information about how the Return-to-Work Incentive is managed? Call us at 425.917.7667. There are many reactions when an employee is injured at work and must be gone from the workplace. It is an uncertain time for all involved. What is important to an employee injured on the job? Who will complete the work that this employee did? How long will they be out? These thoughts are often centered on the negative. An alternate approach is considering “What can the employee do?” This positive thinking strategy can reduce claim costs, rates, and increase an employee’s feeling of self-worth, and perhaps, increase the likelihood of earlier return to work by as much as 30%. Studies show that increased supervisory and HR interaction with an injured worker soon after an injury is highly effective. A quick phone call asking the employee how they are, letting them know they are missed, and discussing what tasks they might be able to perform even if still injured (but released to light duty) is associated with a 30% higher return-to-work rate for employees. This simple “are you OK?” phone call can be a real game changer for the employer and the employee. This gives the employee the opportunity to ask questions, feel that they are a part of the team and a contributor to the employer. The employer can get the work done. Imagine never hearing from your boss if you had been off work for 1, 2, or 3 months. The longer the employer is silent, the greater chance that the employee is considering never returning to work and considering that a pension is a better option than returning. After an employee is injured, get in touch two or three days after the injury to express your concern, especially if the employee has not returned to work. This is when the worker might begin to wonder if they are missed. The goal of the call is to provide encouragement and help your employee recover faster. This is not a one-time communication; stay in contact. Below are some suggestions. Supervisor Script – Are You Okay? We are so concerned about you. The team misses you. No one can teach reading, coach tennis, etc. like you do. We hope you can return to work soon. I am working with HR to find out what we can do. Based on how you are feeling, and since you know your work, are there any duties that you think you’d be able to do now? May I call back in a few weeks to follow up with you? Consider this – a custodial employee with a back injury is released to light duty 2 weeks after the injury. They are not able to reach above their head for more than 3 hours a day and have a 15lb lifting restriction. One employer might determine the employee cannot return because they cannot lift 50-lbs. Our positive-thinking RTW Coordinator might ask, “what can the employee do?” and determine that the employee can walk, stand, lift 15-lbs, bend, etc. This employee could be given 8 garbage bags instead of 2 for the day. This worker could be assigned a shift where, when collecting garbage, they separate the garbage into many bags instead of just one heavy one, reducing the weight they are handling. Providing a sub for lunch tables and sports set up may be a reasonable accommodation to keep this employee at work. Even considering a part-time shift is a solution for this employee. PSWCT and many of our members see the benefit in returning employees to either modified duty (a change in their job) or alternate duty (temporarily assigning different job tasks). I have spoken to many of you and have been very happy to see that several of you have a RTW Program in one form or another. With the RTW incentive criteria being developed, it has been my goal to provide guidance on what a qualified program would look like. It can be easy – documentation of a commitment for your employees to RTW, job offer letters to employees when a group of tasks is found for the employee, administration’s buy-in to a RTW program and a culture of accommodation and RTW known by all employees and understood by supervisors create a successful RTW Program. If we haven’t met and you are interested in the program, please do contact me, Aliza Hauser, RTW Manager at 425-917-7660. Winter is finally here and with it comes a host of unpredictable challenges that make getting around difficult. While the weather can be dreadful at times, we still have to leave the safety of our homes and go to work, among other things. So just how can we remain safe when navigating through the hazardous conditions that winter brings and contribute to the safety of others? Here are a few winter safety tips to consider. Avoid smooth soles and opt for a heavy-treaded shoe with a flat bottom. Try a pair of cleats for additional traction. There are many inexpensive options. 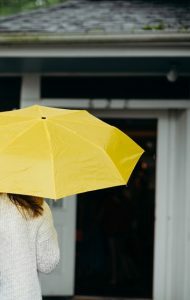 While walking in the rain or on snow or ice on sidewalks or in parking lots, walk consciously. Look up to be aware of anything in your path including ice, uneven surfaces or debris. Occasionally scan your vicinity to ensure you are not in the way of vehicles or any obstacles. Be attentive – put your device away and try to keep your hands free. Do not rush, take your time. Walk slowly, shorten your stride and plant your feet securely on each step. Where available, firmly grip handrails. Be on the lookout for black ice that may appear as wet pavement. Building entrances may be wet with melted snow and ice or from shoes that have been drenched in the rain. When you arrive at your destination such as school, work, or a shopping center, be sure to look at the ground as you enter the building. In hazardous conditions, drive under the speed limit, use slow and steady maneuvers, and avoid any sudden stops, starts, or turns. You will have better control of your vehicle. Increasing the driving distance between you and the vehicle in front of you can help avoid collisions. Should you need to make any sudden maneuvers, the extra distance provides the space to do so. It’s nearly impossible to see black ice, but you can spot it when your headlights reflect off the road at night. This is why it is important slow down a couple of hundred feet before stop signs and traffic lights. When driving in wet or rainy conditions, avoid standing water at all costs. It is often difficult to tell just how deep the water is, and standing water greatly increases your risk of hydroplaning. If you cannot avoid driving through standing water, go as slow as possible to reduce your risk of hydroplaning. 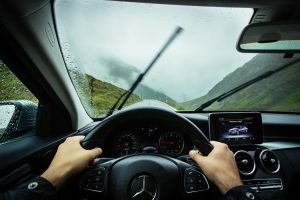 Rain can obstruct a driver’s line of sight. Using headlights helps you see and helps other drivers, cyclists, and pedestrians see you. Do not use high beams in the rain, as they can scatter light and actually reduce visibility. This is the time of year we consider the good things we have—like our partnership with you. In our many years together, the PSWCT/UP team has come to see you not just as colleagues and business partners, but also as friends. We value our relationships and appreciate the trust you have placed in us. During this season of reflection, I have been thinking about what matters and that makes me hopeful. This year has brought many changes and many confirmations of goodness. There are several standouts I want to share with you. Stakeholder Experience. One of the great joys of our work is our relationships and connections with our school district partners. We strive to provide you with the programs and services you need to support your mission and vision and in which you find tremendous value. We will continue to improve our systems and offerings to create the best experience for you in an environment that fosters excellent claims management and risk reduction. Towards that end, we’ve begun to ask for your feedback on our services in the areas of pool administration, claims management, and loss control and safety. We look forward to your responses. Cultural Proficiency. Puget Sound ESD and PSWCT/UP endeavor to become an anti-racist multi-cultural organization. We are working to provide culturally relevant services to injured workers. We’ve begun to collect information voluntarily submitted by injured workers to inform our understanding of the supports needed by them. This is an emerging area for PSWCT/UP and I am hopeful about the possibilities before us. Educational Continuity. We recognize our educational community’s responsibility to help students navigate and succeed in the classroom. Consistency in school staffing is a key component in this endeavor. That is why we partner with you to ensure we return staff to work as quickly as possible. In the early new year, we will be building on our commitment in this area through an equitable return-to-work incentive program. See our related article in this issue of Sound Advice. Employee Experience. Our staff is our most important asset. They are as important to us as those who we serve, namely you and your staff, particularly injured workers. As such, we continued to invest in their professional development and growth to provide the best-in-class service to you. We are fortunate to have a great team and we want to offer all the support we can through their proficiencies and skill sets. Stewardship. 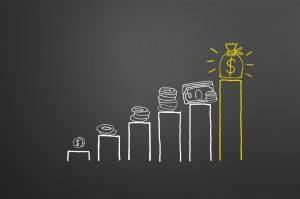 The importance of budgets in school districts is not lost on us. Our programs are designed to put the funds you have entrusted in us to the best possible use. From loss control and safety to claims and litigation management to return-to-work programs, we align resources with best practices in our space to reduce your total cost of risk, resulting in a stable, predictable, and economically feasible risk financing model. I encourage you to join us for our Annual Trustee meeting on February 12, 2019 to learn about new programs and a panel discussion, Small Actions for Big Impact—Minimizing your Exposure. Also, please continue reading this edition of Sound Advice for timely news from PSWCT. Thank you for the opportunity to serve you. We look forward to moving into the New Year with you. Wishing you peace and joy during this season. Earlier this Fall we distributed our first in a series of three surveys about our services, this one focusing on Pool Administration services. A big thanks to all who responded. This valuable information will serve as a baseline as we continue to measure the efficiency and effectiveness of our services. Our mission is to provide exemplary claims and risk management services to our members. We will use your responses to guide our work. The results of this inaugural survey were good overall. It appears we are meeting your needs in the areas of rate setting and communication, staff interactions, and your overall experience. 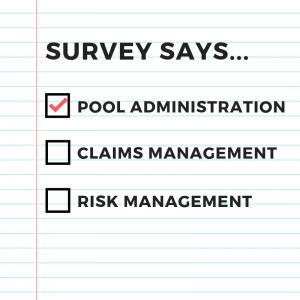 While this survey focused mainly on rates and other pool administration subjects, you did provide some specific comments on claims management. We appreciate your feedback and will work to make improvements. Please note, that a claims management-specific survey will be distributed in February where you will be able to share additional comments. Thank you again for your cooperation. You are important to us as a member and as an integral part of managing and preventing claims. We value your contributions to keeping staff safe and healthy, and we will use your feedback to guide us in expanding what is working and fixing what is not. During these cold winter months, it is tempting to bring candles or scented products into your classroom or workspace to create a warm, cozy atmosphere. However, doing so may affect the health and safety of your staff and students. Although these items add a welcoming warmth and glow, they can also contribute to indoor air pollution. Thousands of natural and synthetic chemicals are used in scents; some of them are proven irritants, toxins, allergens, reproductive toxins, or even carcinogens. It also has been found that there is a strengthening effect when multiple allergens are used together. While these harmful emissions are typically low and do not pose a significant threat to your health, they may trigger allergic reactions and asthma attacks in sensitive individuals. According to national statistics, an average 10% of students have some degree of asthma. 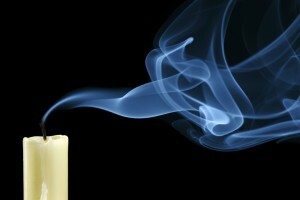 Symptoms of exposure to emissions from burning candles may include itchy and watery eyes, sore throat, blocked nasal passages, headaches, hives, skin irritations, and difficulty breathing. Any of these symptoms may interfere with a student’s learning. 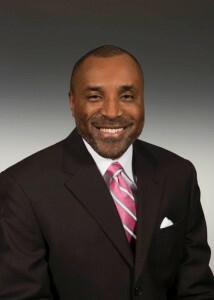 The American Lung Association (ALA) encourages organizations to establish fragrance-free policies as one of their main components of creating a “Lung Healthy Work Environment.” They note that “fragrances can and do affect indoor air quality,” as well as posing health hazards for employees with allergies and chronic lung diseases. The ALA provides several resources for establishing such a policy on their website. The Puget Sound Workers’ Compensation Trust (PSWCT) is developing a return-to-work incentive to create an equitable and sustainable framework to support members in implementing best practice return-to-work programs to reduce individual and collective total cost of risk. The criteria for this program were modeled on the Washington State Labor and Industries (LNI) program, with some changes made to fit the structure of a self-insured program. Among other things, districts will need to have a return-to-work program that is approved by PSWCT. Districts receiving the incentive would have a budgeted amount of money to work with that would expire at the end of the year. These funds would not roll over into the next year. There will also be claim-specific eligibility criteria, such as the claimant having a medical release to restricted duty, as well as an injury date that falls on or after the incentive program start date, among other factors. PSWCT will provide districts with a list of eligible claims. PSWCT will calculate the amount of incentive pool funding districts are able to receive. In determining allocation by district in terms of district size, PSWCT wants to ensure that disbursement of these funds is equitable. To achieve this, allocations will be based on worker hours with a minimum sum allocated to smaller districts. PSWCT plans to roll out this program in Spring 2019. Additional information and communications will be made available at that time. Please see below for specific information for each component. PSWCT-allocated funds, determined annually, to access incentive. Unused incentive funds for the period not rolled-over for future use. Compensable with injury dates on or after incentive program start date. School districts submit reimbursement requests for all eligible claims no later than December 31st following the end of the fiscal year for which the reimbursement request is being made. PSWCT reserves right to suspend program at any time. We know that returning injured employees to work in a timely manner improves outcomes both for the employee and the school district. That is why we created a Return-to-Work position to address the gap between workers being released back to work and the districts being able to accommodate any light or modified duty restrictions. 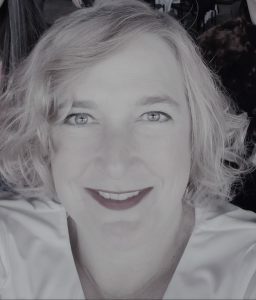 Aliza Hauser has joined our team as the Return-to-Work Manager to lead this endeavor. She comes to PSWCT with over 12 years of experience in the return-to-work and job development process. Aliza will be dedicated to managing the Return-to-Work program for the Trust and supporting school districts as they return their injured employees to work. She will also work with the claims consultants, providing individual case management services to help our district representatives save money for their districts through lower claim costs and workers’ compensation insurance premiums. One of our key goals for 2018-19 is to bring stakeholders together for the best workforce outcomes. To achieve that goal, we are focusing on our Return-to-Work Interactive Process. This process ensures that all stakeholders are engaged and all available return-to-work options are thoroughly explored at the district level. Aliza has already begun meeting with district stakeholders to learn about their return-to-work programs, and has learned that many districts want their employees back at work as soon as possible. She has also found that most districts do have a return-to-work program and just need support in documenting the work that they are already completing. Aliza will also be working towards the goal of supporting members in reasonable accommodations and returning their injured workers back to work sooner. Aliza will be calling all of our district contacts to introduce herself and to set times for on-site meetings to discuss the Return-to-Work program. We look forward to partnering with you in this important work.